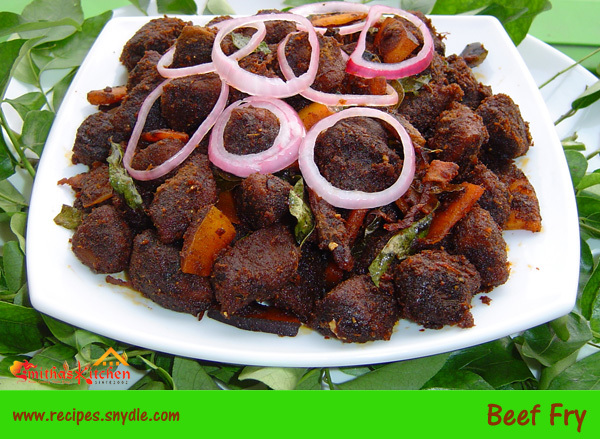 BEEF FRY is one of the traditional beef recipes in Kerala that can be cooked easily. The cooked beef shall be pan fried or roasted on low flame till the moisture gets evaporated and the meat gets coated with spicy masalas. The addition of roasted crunchy coconut slices and coconut oil make this dish very special in its each bite. It is an excellent combo dish Kerala Paratas, Appam, Chappatis etc. Marinate the beef cubes with ingredients given in section 1 above and keep it aside for 1 to 2 hours. If you are keeping it for more than an hour, keep it in the refrigerator. The more time you keep marinate this, the tastier the beef would be. Heat a pan in medium-low flame and dry roast all the ingredients given in 3rd section for 2 minutes. (do not add oil). Make sure it is on low flame, otherwise it will burn. Allow this masala powder to cool. Pressure cook the marinated beef cubes for 3 to 4 whistles, or until it’s cooked to your desired level. Heat 2 tbsp oil in a wide open pan and add chopped onions, tomato, ginger, garlic, curry leaves, sliced coconuts and sauté well for 6 to 8 minutes. When they are well sautéed and have a flavour add the fried masala powder, crushed black pepper corns and fry for a minute. Add cooked beef into the pan with the gravy and combine well. Do not drain the excess water while cooking beef. Cook uncovered for about 20 to 30 minutes, stirring in between, drizzle some oil if needed and let it brown and dry in the medium-low heat. Add few more curry leaves and combine well. Serve it hot with Kerala Porotta, Appam or Chappati.